Tai Chi Ball Qigong training is an important component of proper tai chi chuan practice. 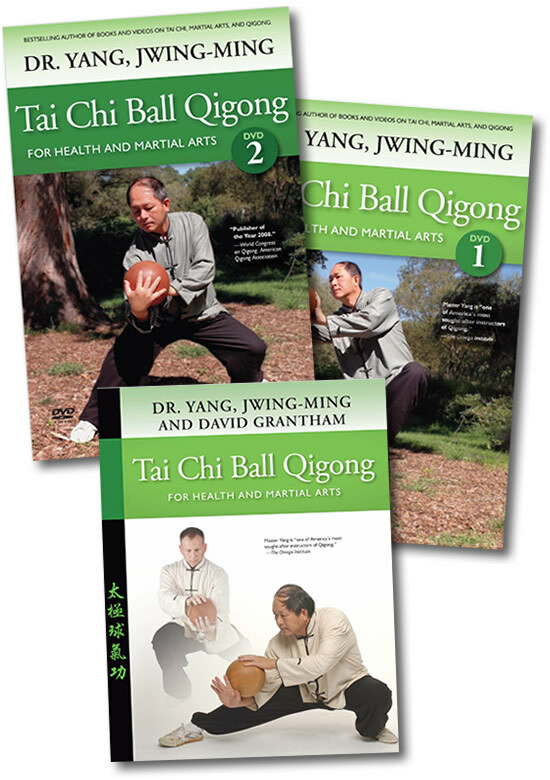 Dr. Yang offers you years of Tai Chi Ball training with this complete set of instructional material. The popularity of Tai Chi Ball training is no accident. Dr. Yang has worked tirelessly researching, compiling and developing these training resources. He says "In all my years of teaching, I believe that Tai Chi Ball Qigong is one of the most powerful exercises I have ever seen to rebuild the entire body's health." Please consider a hand made Tai Chi Ball from our Basic to Artisan collection. Bundle contains 1 book and 2 DVDs. Tai chi ball qigong training is an important component of proper tai chi chuan practice. For martial artists, tai chi ball qigong training can strengthen the torso, condition the muscles, and increase physical power by using the mind to lead the qi. It can be a major training tool to enhance pushing hands ability. In Course 1, Dr. Yang, Jwing-Ming teaches fundamental Taiji Ball breathing techniques, and 16 basic patterns of stationary and moving Taiji Ball Circling, both Vertical and Horizontal. Course 2 focuses on 16 basic patterns of stationary and moving Taiji Ball Rotating, both Vertical and Horizontal. In Course 3, Dr Yang teaches 16 patterns of Taiji Ball Wrap-Coiling, including vertical and horizontal. Course 4 focuses on solo and partner applications, which improve coiling and neutralizing taiji skills, and develop “listening jing", or sensitivity.